TALKS AT THE Labour Court between representatives of the Irish Nurses and Midwives Organisation and the government aimed at ending recent industrial action have concluded for the night. 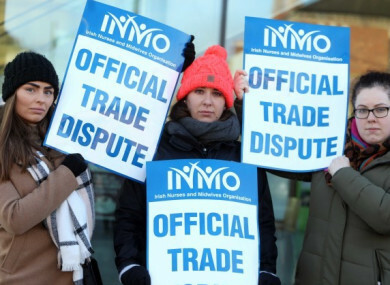 Both sides are due to meet again tomorrow afternoon in efforts to resolve the situation, which has seen nurses out on the picket lines for three days already with more to come. Nurses are striking over pay and working conditions, which they say has led to a recruitment and retention crisis within the sector. Striking nurses this week spoke about under-staffing on wards, nurses leaving the healthcare sector in large numbers and overworked nurses feeling under-appreciated. So far, however, the government has refused to countenance giving the nurses a raise outside of the terms of the public sector pay agreement agreed in 2017. The nurses are not accepting of this and as of yet there seems to be no bridging the impasse. A rally scheduled for tomorrow afternoon in Dublin is set to go ahead, as are the strike days next week. Speaking to reporters this evening leaving the Labour Court, INMO General Secretary Phil Ní Sheaghdha said that the talks had been exploratory in nature. “We have spent the day giving information from our side and from the management’s side and they’ve asked us to reconvene tomorrow at half three and we intend to do that,” she said. She said today was an “information sharing approach” to negotiations. “I think it’s exploring all of the issues that are of concern to us and obviously with the management side it’s the impact of those, so it was a very information sharing type approach and we have to come back tomorrow to see if we can make any progress,” she said. She said she wasn’t going to discuss the “ins and outs” of the negotiations but that she was happy that her team had “clarified our position to the best of our ability”. Strikes are scheduled next week for three dates and the rally beings tomorrow in Dublin city centre at 12.30pm. Email “Talks over nurses' strike end at Labour Court”. Feedback on “Talks over nurses' strike end at Labour Court”.